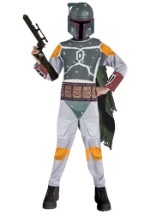 Become the infamous galactic bounty hunter Boba Fett in this deluxe kids costume! This costume features a two-piece helmet that is green with maroon and authentic details, just like in the movies. It is held together with strong velcro. The grey, polyester jumpsuit has yellow and green molded armor on the shoulders, torso and knees. A cape attaches on the left shoulder and a brown, molded belt wraps around the waist. Don't forget to arm yourself with Boba's blaster and his iconic jet pack by checking out our accessories!